It’s been five years since the phenomenon that is The Play That Goes Wrong erupted into being in a little theatre above a pub. Since that moment Mischief Theatre have gone from strength to strength, firmly establishing themselves in the national theatre-going conscious as purveyors of comedy sans pareil. Wisely, they have deviated from the original formula of collapsing sets and forgotten lines and used their seemingly boundless versatility to shoot off in a new direction. 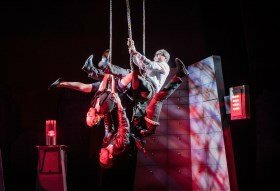 The Comedy About a Bank Robbery is a different beast from Play, though no less funny; it is a wickedly comic farce, bristling with rapier-sharp wordplay and bolstered with superlative physical slapstick. Set in the 1950s (to an incidental soundtrack of cheerful doo-waps, performed by the cast during scene changes), the story centres on the attempted heist of a humungous diamond from a rather shambolic bank in Minneapolis. Further exposition on the plot would be futile as it is wonderfully nonsensical and, furthermore, merely a vehicle for a series of superbly awful puns, madcap capers and athletic visual gags. There are Airplane! style verbal misunderstandings, appalling disguises which somehow manage to fool everybody, a fight between three people who are all played by the same actor and some very clever tom-foolery involving a fold-up bed. There is also, without giving too much away, a piece of visual redirection which is so technically awesome that it drew gasps of wonder from the audience. The acting is excellent, helped by the fact that the cast do not appear to be taking things seriously at all and are apparently having the most marvellous time. It would be unfair to single one out of so many, but on the night we visited, two of the roles (Ruth and Sam) were played by understudies (Lydia Fraser and Jack Whittle) and, had we not seen the notices, we would have been none the wiser. The energy, dedication and sheer punch which goes into each performance is admirable, and the comedy timing leaves the audience gasping for breath. The backstage operators live up to their actors; direction, lighting and sound are all imaginative, accurate and effective. The Comedy About A Bank Robbery is slick, fast-paced and incredibly professional. However – and this is the endearing thing about Mischief Theatre, and what has helped to make them such a roaring success – it never strays too far from its roots. The venue may be impressive, the technical wizardry may be sophisticated, but the comedy is still deeply, adorably silly. Occasionally we catch a glimpse of the little group performing above a pub on a shoestring; a tatty seagull puppet, an office chair with handlebars masquerading as a motorbike, an underwater scene that consists of random people moving objects around in slow motion, not to mention the fact that many of the cast reappear in various guises throughout the production as different people, merely by changing hats and scarves. This is not an easy trick to pull off, this amalgamation of the amateur and the professional, but Mischief have not only pulled it off, they have made it an asset uniquely their own. There is a charm and almost a nostalgia to their productions which resonates, and which sets them apart from any other group currently performing in London – maybe anywhere. Their originality, inventiveness and sense of good, old-fashioned fun will, I believe, see them leading the comedy train for a very long time. Written by and starring the Mischief Theatre Company who brought you the 2015 Olivier award-winning Best New Comedy “The Play That Goes Wrong” and “Peter Pan Goes Wrong”, book now, to be entertained by their unique brand of humour in this hilarious new show.